Feiglin is only nationalist camp MK to vote for bill against dividing Jerusalem, says right acting in way that led to Gush Katif. Deputy Knesset Speaker MK Moshe Feiglin was the only MK from the nationalist camp to vote in favor of MK Yaakov Litzman's (UTJ) bill requiring 80 MKs to approve any withdrawals from Jerusalem, Israel's capital. The bill was rejected on Wednesday. Only 12 MKs voted for the bill, all of whom were from the hareidi-religious parties other than Feiglin. 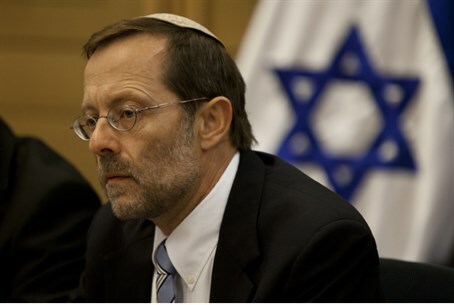 Speaking to Arutz Sheva​, Feiglin said, "I looked at the empty seats of Likud, Jewish Home, and Yisrael Beytenu, and when their names were called and 'not present' was called - I thought to myself, truly the 'right' is not present." Feiglin accused the government of adopting a position like that which led to the expulsions from Gush Katif and northern Samaria, saying "then too ministers from the right didn't want to resign because they said the law would pass in any case." "That's what happened yesterday, there are places where politics ends," stated Feiglin. He added "I'm not more of a patriot than (MK Tzipi) Hotovely or (MK Orit) Struk, but here was a true chance to remove the political fog from above Jerusalem and to determine that it will not be the subject of negotiations." Justice Minister Tzipi Livni and Finance Minister Yair Lapid were among the votes against the proposal. Feiglin asserted that Livni's strong opposition to the bill proves that Jerusalem is on the table in the peace talks with the Palestinian Authority (PA) that she is running. "The left constantly feels the country belongs to them, and even if they're a minority they fight for their path," remarked Feiglin, saying "but here when such an important law was proposed, all of the right disappeared, and I ask why." On Wednesday, Shas Chairman Aryeh Deri similarly criticized the "nationalist" government for turning its back on the bill. Deri commented "those who call themselves a right-wing government chose to forgo the opportunity to keep Jerusalem, the eternal capital of the Jewish people, united."